The inspiring wines of Waipara Hills epitomise the South Island's unique personality. Central Otago Pinot Noir in particular is traditionally endowed with strong varietal characters and bold, lingering flavours. The Waipara Hills team continue to build on their reputation for hand crafting the highest quality, award winning boutique efforts which rise to the expectation of the most demanding Pinot Noir enthusuast, while being accessible to all. It's all about not overworking the wine, allowing the splendid flavours of the exquisite Central Otago fruit to speak for itself. Waipara Hills are crafted from fruit grown to choice sites across New Zealand's South Island. 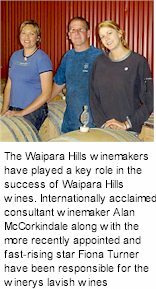 Much is sourced from the Waipara Valley itself but Waipara Hills also operate an estate owned property in the Bendigo sub-region of Central Otago. Named after a local gold rush in the 1800s, the Waipara Hills Golden Terraces are covered by free draining loam schist gravels which make it a natural home to grow fantastic Pinot Noir. Grapes are wild fermented over a term of four weeks on skins. Components complete malolactic during spring and are racked in summer, followed by several months maturation in a selection of new and seasoned French oak barriques. Dark garnet purple colour. A wonderfully rich, in some ways, rustic palate of earth, chocolates, spice and dark cherry aromas. Rife with dark fruits, complemented by savoury spice from the French oak. The nose follows onto the palate with dark cherry and earthy, chocolate notes, as the firm tannins pull the flavours together and leave the palate crisp and awaiting the next sip. Fully approachable while young as it exhibits the essential character and firmness of palate expected from Central Otago.